Certificate lifecycle management is a troublesome issue for many IT professionals, especially when certificates expire. While certificates can often be renewed automatically, the applications that depend upon these applications are often not aware of the renewed certificate. This prevents the application from utilizing the renewed certificate and eventually the old certificate expires, which often results in a service outage. Another issue with certificate lifecycle management is a lack of notification before a certificate is about to expire. Starting in Windows 8 and Windows Server 2012, administrators can utilize certificate services lifecycle notifications to help manage certificate over their lifecycle for users and computers. By using Windows® PowerShell cmdlets, administrators can register certificate notification tasks to be run upon certificate services lifecycle events. For example, an administrator could register a task that would run a Windows PowerShell script to renew and reconfigure a certificate for an application when the existing certificate is about to expire. Monitoring software: Software products, such as Microsoft System Center 2012, can monitor certificate lifecycle events directly from the event log . Configuration scripts: Administrators can configure Windows PowerShell scripts that modify system or application settings based on specific certificate lifecycle events. 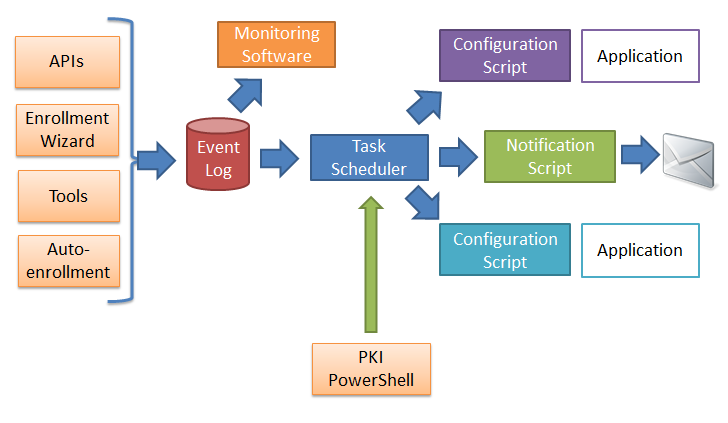 A configuration script can be deployed using PKI Windows PowerShell cmdLets for expiration and replace events. 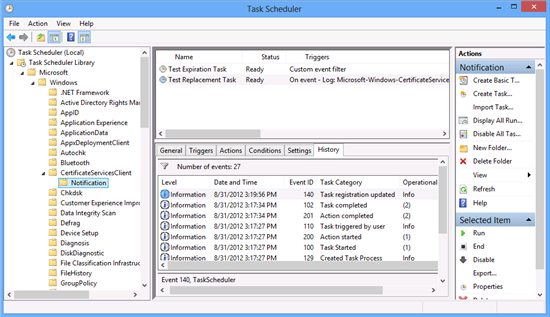 Task scheduler can be used directly to launch scripts for any lifecycle notification. Notification scripts: Administrators can configure a script to notify them via email or a log. Applications: Developers of applications that take advantage of certificates can use Event Log APIs to monitor the status of certificates they are using. Each log has a subordinate Operational log where the certificate services events are recorded. Autoenrollment, when Renew expired certificates, update pending certificates, and remove revoked certificates is NOT selected. Autoenrollment, when Renew expired certificates, update pending certificates, and remove revoked certificates is NOT enabled. • Certificate deletion when in the Export Wizard user choses an option that says to delete a certificate. Autoenrollment, when Renew expired certificates, update pending certificates, and remove revoked certificates is enabled. Except for expiration and close to expiration notifications, only certificates in MY store are covered. Only certificates exported with private keys generate the exported event. In the Task Scheduler there is a new task category called Notifications in the Task Scheduler Library, Microsoft, Windows, CertificateServicesClient. These tasks can be created using the Windows PowerShell cmdlet New-CertificateNotificationTask. To review certificate services notification tasks that have already been created on a computer, you can use the Get-CertificateNotificationTask cmdlet. To remove a certificate services notification task, you can use the Remove-CertificateNotificationTask. In Group Policy in the Certificate Services Client - Auto-Enrollment Policy, you can configure the percentage of lifetime left on the certificate before a warning is displayed. You can also configure additional certificate stores to be monitored. The CurrentUser\My and LocalMachine\My stores are monitored by default when the policy is enabled. 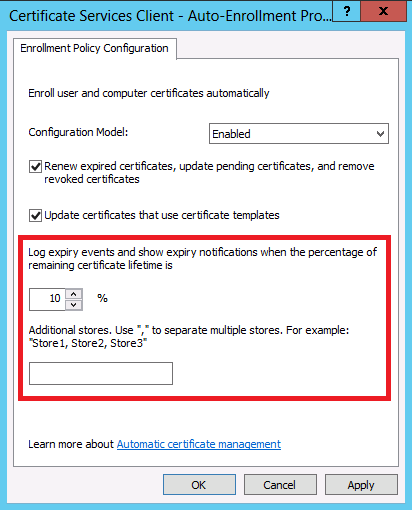 You can configure the Log expiry events and show expiry notifications when the percentage of the remaining certificate lifetime setting as appropriate. 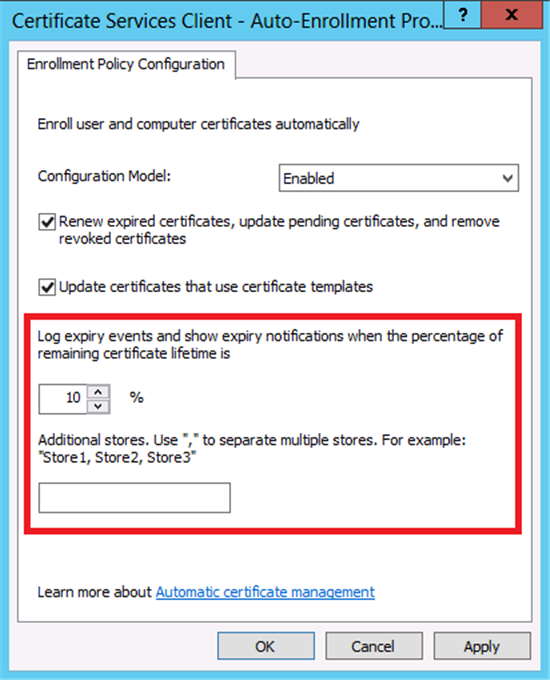 You can also use the Additional Stores section to configure additional certificate stores that you want to monitor for certificate expiration notifications. To understand how certificate lifecycle notification could be useful, consider the renewal of a certificate for a web site that uses Internet Information Services (IIS). Although a certificate can be automatically renewed, it does not automatically rebind to the IIS site utilizing the certificate. A Windows PowerShell script could be utilized to replace the certificate binding upon certificate renewal. For example, consider the following script, named UpdateIISCert.ps1. When the task is created, it includes the thumbprint definition for the $OldCertHash. The Windows PowerShell script is automatically run when any certificate in the Cert:\LocalMachine\My store is replaced. If the certificate thumbprint that was replaced matches the certificate thumbprint of $OldCertHash, then the IIS binding is updated to the certificate that matches $NewCertHash. Specific additional considerations are elaborated in the following sections. Certificate services notifications are designed to trigger Windows PowerShell scripts to perform administrative tasks, such as binding a renewed certificate to an application. Since these Windows PowerShell scripts are run with system privileges, they could be a target for an attacker to run malicious code. Administrators should be cautious to ensure they set the appropriate permissions on the scripts to help prevent the scripts from being used for other than their intended purposes. To prevent scripts from being tampered with, you can use digital signing on your PowerShell scripts. For information about signing PowerShell scripts, see Windows PowerShell Sign Here, Please. Test certificate lifecycle notification scripts to ensure they do not cause error conditions that will consume resources unnecessarily. Review the Task Scheduler Library's scheduled tasks to ensure that inappropriate tasks are not configured to run when a certificate services client notification event occurs. Review the Task Scheduler to ensure that scheduled tasks are not failing. When scripts are published to remote servers, only secure communications should be used. The CertificateServicesClient-Lifecycle-User Event log channel is shared by any logged on user. Any logged on user can write an event log entry that appears to have been generated by another user. Therefore, you should not rely on this log to prove that a particular user performed a particular action. A script configured to run based on events in the CertificateServicesClient-Lifecycle-User Event log channel will be run for all logged on users. The script should verify the user account does have the particular certificate, before making any changes. Also, the information in the Details section of the CertificateServicesClient-Lifecycle-User Event log channel can be spoofed (as previously explained), so those details should not considered sufficient for security purposes. The script should verify the certificate exists and verify its details. The script should also be configured so that running multiple times does not cause problems.